NEW MODEL Minimalistic miniature regulator. Case in satin piano finish with metal inlays, beveled crystal glasses, dial 11,5 cm enamel dial with diamond turned second ring and polished brass rim, blue Breguet-style steel hands, a wooden pendulum with polished 8 cm disk and chrome plated brass weights. Kieninger 2806-77-02 - Please request a delivery forecast. NS 004 - Time only, Pendulum and Weight drive movement. 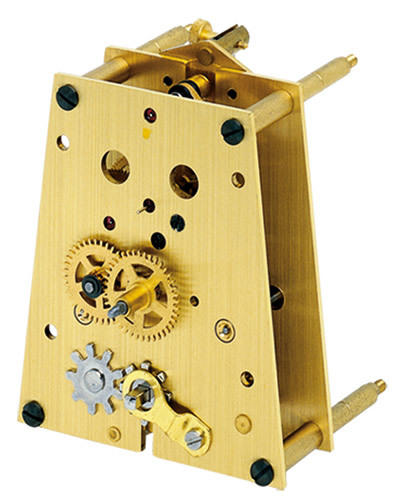 Kieninger Precision cable movement with 8 rubies and 6 bronze bushings, Graham steel pallet lever escapement, automatic beat adjustment, maintaining power and second indication. Click here to view the Kieninger 2806-77-02 Options and Prices page.